Technical Analysis and Elliott Wave Theory: 1100! In the chart above you see how I see the rally since 1020. First we've got five waves up making it wave (a), followed by wave (b) and wave (c) currently underway. So far, I can count four completed waves of wave (c). The last wave seems to be still in progress. wave  to 1091, wave  to 1086, wave  to 1099 and wave  to 1097. 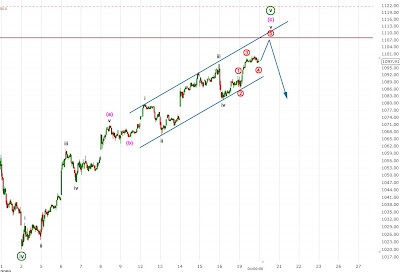 Tomorrow wave  should unfold with a possible target of 1108ish.